Belgium international midfielder Marouane Fellaini has ended speculation about his future after penning a new contract with Manchester United. Manchester United have reported on their official website that Fellaini has signed a new contract which will keep him at the club until June 2020, with the option to extend for a further year. The 30-year-old has scored 20 goals in 156 appearances across all competitions since his arrival at the Old Trafford outfit in 2013, and has won the FA Cup, EFL Cup, UEFA Europa League and Community Shield with the club. ''I am pleased to be continuing my journey as a Manchester United player,'' Fellaini stated. 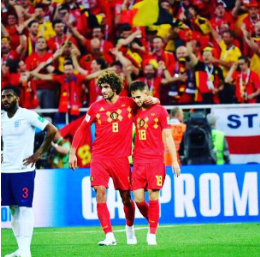 Fellaini was in action for the Belgian side in their 2018 World Cup matches against Tunisia and England. He previously represented Anderlecht, Mons, R. Francs Borains, Sporting Charleroi, Standard Liege and Everton.